1. This is the last week to collect donations for our fundraiser. Students are asked to seek donations for various school activities and programs. The students will then walk for one hour on the afternoon of September 24. We will have a study hall environment that afternoon for students who choose not to raise money. We will collect envelopes Wednesday through Friday. 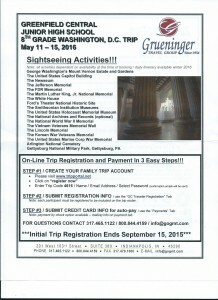 2.Tuesday is the last day to sign up for the 8th grade Washington DC trip. It is better to sign up now and back out later. 3. Dannah Gresh will be speaking to our students on the morning of September 23. She is a nationally known speaker and author who talks about making good choices and purity. For parents who are interested, she will be speaking to parents of adolescents on the evening of September 23, at Brandywine Church. 4. If you know someone who would like to receive the GCJHS parent newsletter, please let them know they can sign up on our webpage. 1. We have multiple ways for you to obtain information regarding what’s happening at GCJHS. 2. Breakfast is available to students every morning before school. We distributed our fundraiser last week. Students are asked to seek donations for various school activities and programs. The students will then walk for one hour on the afternoon of September 24. We will have a study hall environment that afternoon for students who choose not to raise money. We will collect envelopes next Wednesday through Friday. Our first after school dance will be in the gym on Friday, September 11, after school until 5:30pm. Dress is school casual. Cost is $3 per person. While there are some “couples” who attend together, most students just dance in large groups. It’s a fun time for students to be together outside the school day. Congratulations to the 7th grade volleyball team for winning the Hancock County tournament! 1. Friday is School Pictures Day. Students who are in Physical Education classes will take their pictures at the start of class. 2. Sports pictures are also on Friday, after school. 3. The GCJHS PTO will meet the first Wednesday of the month at 6pm in the school cafeteria. The next meeting is Wednesday, September 2nd at 6pm. All GCJHS parents and guardians are invited to attend. Please see our athletic pages to see upcoming sports contests! The GCJHS PTO will meet the first Wednesday of the month at 6 pm in the schools cafeteria. The next meeting will be Wednesday, September 2nd at 6 pm. All GCJHS parents and guardians are invited to attend. Hancock County Chalkfest 2015 -11 a.m. to 3 p.m.Saturday, Sept. 19: The Hancock County Arts Council and Greenfield Main Street have been hard at work preparing for Chalk Fest 2015. It’s just $5 per person and is a fun, affordable family event. Artwork will be judged by age group — K-3rd, 4th-6th, 7th-8th, 9th-12th and adult — and cash prizes will be awarded for the top two winners in each age group.